These rubbery "Crocs" style sandals were made for a 7-inch tall doll with flat feet using Sugru moldable silicone. You can use a similar method to make sandals using polymer clay or the homemade version of Sugru, Oogoo if you prefer. The Sugru or Oogoo make a very realistic "rubbery" sandal, although some parts must be cured before final assembly, which makes this a two-step (two-day) process as you wait for the first stages to cure before adding in the final details. It is useful to have a photo or an example of real 'crocs' sandals as a reference. 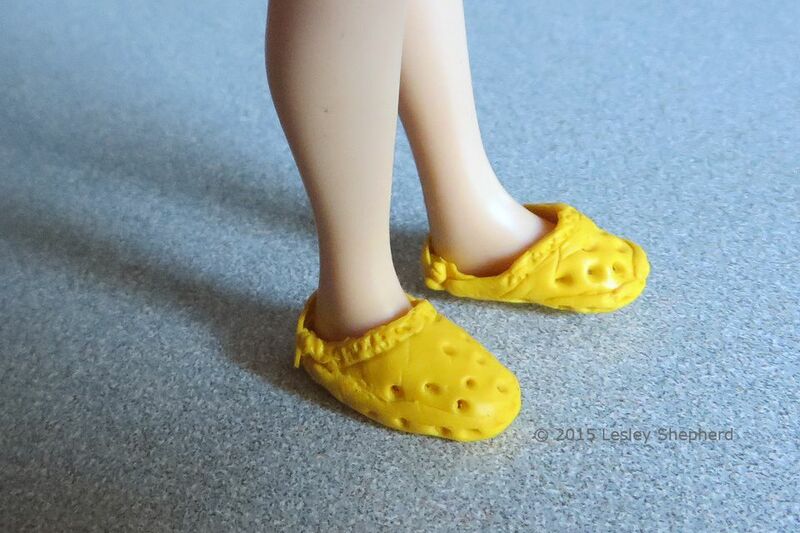 The miniature "Crocs" sandals for the doll were shaped over a pair of custom shoe "lasts" which can be used to make a range of miniature shoes. Using lasts prevents accidental staining or moldable silicone adhering to the doll's foot. Use these instructions for making shoe lasts for dolls to make the basic shape you will model your 'crocs' sandals over. Once you have made the lasts (mine are made from waste polymer clay) wrap the lasts with cling film (plastic film) taking care to set any seams for the film on the sole side of the last. You want the sandal upper to be shaped over a layer of film with as few wrinkles as possible. If you are making your doll sized "Crocs" sandals from Sugru, make sure you have all your materials ready before you begin, as you have only 30 minutes working time with the material before it begins to set. You will need the shoe lasts wrapped in plastic film, the Sugru in your choice of colors, a paper tissue or paper towel, some soapy water as a resist, a polymer clay blade or modelling knife, and other simple modelling tools including a pencil or pen to act as a roller and some cling film / plastic film to act as a work surface. I set a piece of clear plastic packing tape on one end of my Sugru packet before I cut it in half, and covered the cut edge with the packing tape as quickly as possible to prevent half of my Sugru from curing. Kept tightly packaged in the fridge it will keep for at least a week if you quickly seal the cut against air. One-half package will make more than the "crocs" uppers and back straps for a dollhouse-sized doll. Have several small projects ready to prepare before you begin so you can make extra miniatures from any leftover Sugru. If you don't have enough material when you start, you can always add more in at another stage. These instructions can be used to make a range of kitchen tools from Sugru with wood and metal handles in case you have any left over from your "Crocs" sandal project. A simple dollhouse toilet plunger is another good project for leftovers and can be assembled in two stages. If you will be making your sandals from polymer clay, you won't need tissue or paper towels or soapy water. Flatten Your Modelling Material to Begin Making the Doll Sized "Crocs"
Begin making your miniature sandals by rolling most of your material out to an appropriate thickness for the size of doll sandal you are making. I rolled my material thinner than 1/16 inch (1.6 mm). As I was using Sugru, I rolled it out between two layers of cling film/plastic film using a round brush handle as shown in the photo on this page. To begin shaping the uppers for a pair of doll-sized "Crocs" sandals, peel the flattened Sugru (or polymer clay" away from the plastic film and drape the flattened material over the upper part of the shoe last as shown in the photo on this page. Use the polymer clay blade or a modeling knife to trim the excess material level with the bottom of the sole, taking care to pull a bit of the material off to the sides, but leaving the back of the heel clear. See photo next page. Trim and Shape the Doll "Crocs" Uppers. Trim the upper section of the doll-sized 'Crocs' sandals as shown on the plastic film covered shoe last. Use a toothpick or a pointed modeling tool or silicon clay shaper to mark the distinctive holes in the top of the shoe. You can use a straight edge of the blunt side of a polymer clay blade to mark a 'band' line across the top of the shoe where it touches the doll's ankle. If you are making the shoes from Sugru, set the uppers aside to cure the recommended 24 hours. Then remove the upper from the last and check the fit against your doll. If you are making the shoes from polymer clay, set the last and clay into the refrigerator to firm up. Remove from the last and set the clay onto baking soda or salt in a foil pan and bake at the recommended temperature for your clay brand. Roll out a section of the Sugru or polymer clay and square it off with a knife to make a rectangle that will be cut into strips for back straps for the "Crocs" style sandals. Use a polymer clay blade/tissue blade or another straight edge to mark the edges of the straps through the Sugru or polymer clay. Set the Sugru aside to cure for 24 hours or bake the polymer clay at the correct temperature for the clay. When cured, separate the straps into individual sections. If you wish you can texture the straps with a fine brush, or use a straight edge to make cross marks on the straps. Trim the Uppers to Fit the Soles of the Doll-Sized "Crocs"
Once the uppers of the 'crocs' style sandals have air cured or been baked in the oven (polymer clay) trim the base of the uppers so they sit slightly higher than the sole line of the shoe. Cover the shoe lasts again with plastic film, this time so the gather lines will be away from the shoe soles. You want the plastic covering on the soles to be as flat as possible. To finish soles for the doll-sized "Crocs" style sandals, roll out a section of fresh Sugru, or polymer clay, and trim it to shape around the base of the doll's foot against the upper you completed in an earlier step. To finish the doll-sized pair of "Crocs" style sandals, roll a thin cylinder of Sugru (or polymer clay if that is the material you are using) and press it gently all around the sandal, covering the join between the upper and the sole. Press the roll fairly flat against the shoe, keeping the edge as straight as possible. Use a toothpick or modeling tool to make the "Croc Teeth" pattern at the junction of the front of the sole and the upper shoe. Put a thin layer of soapy water on a flat surface and set the sole of the "Crocs" while still on the last, down squarely onto the flat soaped surface so the sole is flat. For polymer clay, set the sole down onto a layer of cornstarch (corn flour) or talcum powder to flatten the shoe sole. Take a small ball of Sugru (or polymer clay) and flatten it at the point where the upper meets the sides of the sandal on either side. Take a strap strip from the ones which you made and cured (or baked) and trim it with scissors so it is round on one end. Press the rounded end into the small ball of Sugru on the outside edge of the shoe. Take the strap across the back heel of the last (or over the top front edge near the ankle, your choice). Trim the strap to size with sharp scissors and set the end into the ball of Sugru or clay on the inside edge of the "Crocs" style sandal. Allow the Sugru to cure for 24 hours, or chill and remove the polymer clay from the last, then bake it according to the directions for your clay. Sandals made of Sugru can be trimmed or sanded after they have cured. Sandals made of polymer clay can also be sanded and polished after baking if you wish. More shoe projects can be found on the doll shoe list. These include flip-flops and beach sandals as well as mary janes and desert boots for any size of doll.